Is Darrelle Revis done with the Jets? And where is he headed? The song and dance between the New York Jets and cornerback Darrelle Revis may be coming to an end. Revis wants a big contract, the organization has not been willing to give him what he wants in what all started back in training camp of 2010. And now it appears that the Jets are ready to move on, according to Manish Mehta of the New York Daily News, with one source saying that he is "gone." So where could the so-called "Revis Island" be headed? 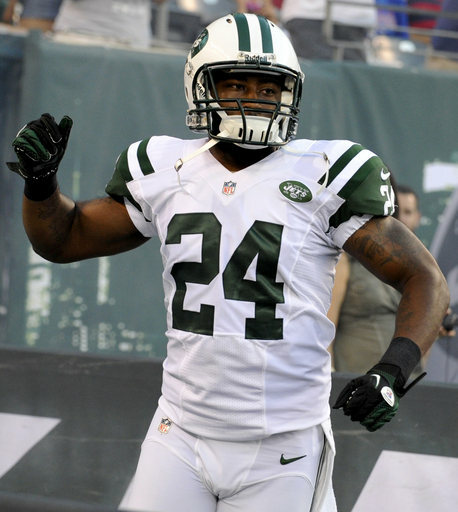 If the Jets are going to move Revis, the timing is important. On one hand, the Jets should try to move Revis sooner rather than later in order to get a good haul of draft picks and with free agency starting around the corner. But on the other hand, some teams may be turned off by Revis's ACL injury and would move in another direction and there are also some teams that would rather wait to see how Revis has progressed and to show that he is healthy, as teams do not like to give up a large package if they are receiving damaged goods. So while the market for Revis is not as big as you would normally think for such an elite cornerback, there are absolutely teams interested with the top two contenders appearing to be the clubs that faced off in the NFC Championship Game. One of those is the San Francisco 49ers, who have a lot of draft picks to play with, with 12 tradeable including the high second rounder they received in the Alex Smith trade and they really need a top-flight corner with Carlos Rogers getting older and Chris Culliver getting torched in Super Bowl XLVII. Bringing in a guy like Revis could make them the favorite for Super Bowl XLVIII and it appears that Revis thinks it would be "awesome" to play for San Fran. The team that fell to the 49ers in the NFC title game is of course the Atlanta Falcons and they are very much in the mix for Revis as well. They recently cut Dunta Robinson and Brent Grimes is also a free agent, plus he also tore his Achilles this past season. For a team that has never won the Super Bowl in their history, making a big play for an elite cornerback like Revis could put them over the top and could land them in the Meadowlands next February. It will be interesting to see how Rex Ryan new general manager John Idzik plays this because Revis is one of their few valuable assets that would help greatly in bringing in a haul to help the rebuilding process that desperately has to take hold and while it would be very hard to replace a guy like him, they will have the ability to find a good replacement early in the draft like Xavier Rhodes or Desmond Trufant. Plus with many needs, bringing in some high picks like another first or a second rounder or two would help greatly. But will Revis's value increase over the summer if he shows he is healthy? That's the fine line in this situation. Its only because they are waiting to see if his Shaft size increases.